For every user and lesson KPLMS stores the number of times the course has run, scores, time taken, individual question results, lesson status, date and time the course was taken, and much more. KP Online Learning Management System / Software (LMS) runs reports on individual users, groups of users, or set a filter for custom reports. Change graphics, colors, styles, turn features on and off, edit all strings as they appear to learners, change course operation and appearance. Customize comments for users, change startup pages and logo per department, and much, much more. Place users into one or more departments for flexibility in serving courses. Assign custom permissions to any user. Allows some to blog, others not to. Allow users in one department access certain courses. KP Online Learning Management System / Software (LMS) can run a myriad of reports, based on dates, scores, courses, departments, and much more. 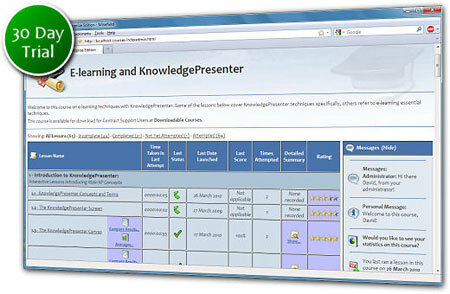 KP Online Learning Management System / Software can customize reports by setting filters, resorting, removing columns, etc. LMS can Export reports to Excel, or automatically have them emailed to you.